Loose-fitting, straight, pullover jumper in two lengths has cutaway armholes. Loose-fitting shirt has convertible collar, dropped shoulders and shoulder pads. 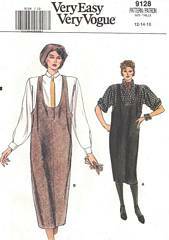 Below elbow sleeves rolled up or long sleeves pleated into buttoned cuffs. Purchased tie. Bust 34, 26 and 38.